Front view. Velcro attachment for the handlebar. Work is trying out a new ebike program and I won the lottery to try one out for commuting. 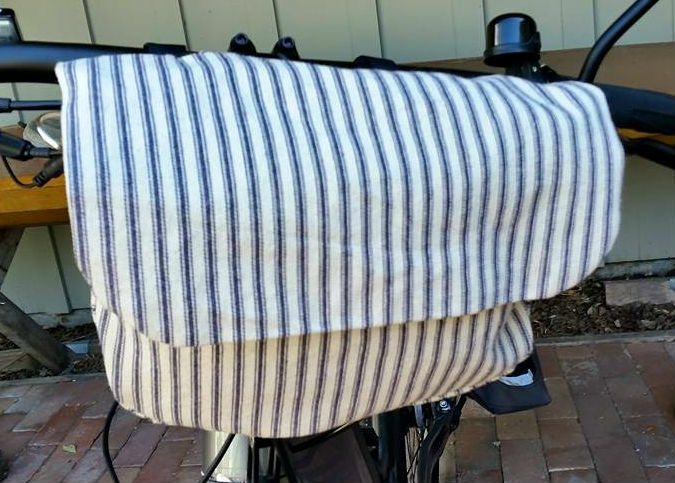 I decided it needed a new bag for the handlebar. I looked around and decided to make one of my own based on a hybrid between the Timbuk2 Colby, the Pocampo 6 Corners Bag, and some features of my own. I made my paper pattern, picked up some cotton ticking and went for it over the Independence Day holiday. Side view. Detachable shoulder strap. Check out the shoulder strap! It is a John Mullarkey original. He threw down the gauntlet to see what I can make with it. I made the strap detachable so I can move it from bag to bag — especially since this is just the prototype. Top/Inside View. 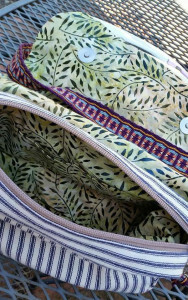 Double zipper, fully lined with 2 inside pockets. Now, having used the bag for a week or so, there are a few changes that I would like to make. I thought the fabric was stiff enough by itself and would not require a stabilizer. I was wrong. 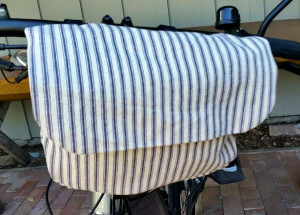 It’s perfect for a purse but doesn’t have enough body to hold it’s shape on the handlebar. It droops over the headlight. A stiff interfacing would help. 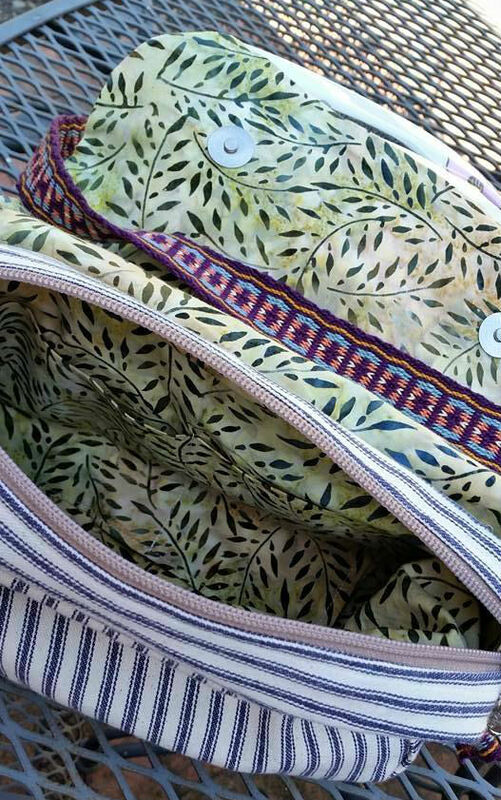 I don’t want to use a plastic insert because I still want the softer look of a fabric bag. I forgot to add an inside key clip. My bike/house keys get lost into the bottom of the bag. I worry about the longevity of the velcro attachment to the bike. Velcro loses it’s “magic” after a while and I want the bag to last. However, I can always continue to use it as a shoulder bag. The attachment point was designed to be about 1.5″ below the top of the bag. Unfortunately, without the stiffener, it meant that the bag droops from that point down instead of sitting taller than the handlebars. Again, I think the stabilizer will help. Pedelec is a pedal assist. You still need to pedal for it to work. You can’t just use the battery power to coast along. I was worried that I wouldn’t get my usual workout if I used an ebike. I had been riding my bike 3 times a week before the ebike. Now, I aim for 4 days a week to make up for the battery assist. I still need a shower when I get to work. It takes a lot of work to keep that pace with a 50 pound bike.